Bran Castle, situated between the Bucegi and Piatra Craiului Mountains, 30 km far from Brasov, is the only touristic point that attracts hundreds of thousands of tourists because of a legend: Count Dracula's Legend, although the historical sources state that Vlad Tepes (Vlad the Impaler) dropped by only once, in his way to Brasov. The construction of the citadel started in 1377 as a border citadel of the Hungarian Kingdom, defending one of the main road towards the Southern Carpathians territory. Some are connecting it with Dracula's Legend, but in fact, it has never been the property of Wallachian prince. 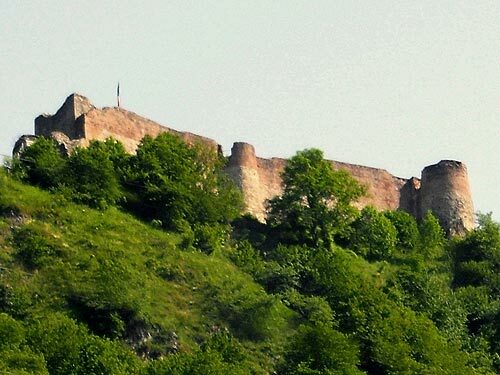 After 1498, the fortress was under the rule of the town of Brasov. In 1917, the town donated the castle to the Emperor of Austro-Hungary. After the end of World War I, the castle has been donated once again by the city of Brasov, but this time to Queen Mary Of Romania (Marie of Edinburgh). After her death, in 1938, the castle passed to Princess Ileana's (lately Mother Alexandra) property, Queen Mary's daughter, and the archduke Anton of Habsburg's wife. After the forced abdication of Romania's Royal Family (1947), the castle passed into Romanian state property, and in 1950 was granted as National Monument. Nowadays, it is a museum. Bran Castle is almost always at the top of the list of Famous Castles in Romania. 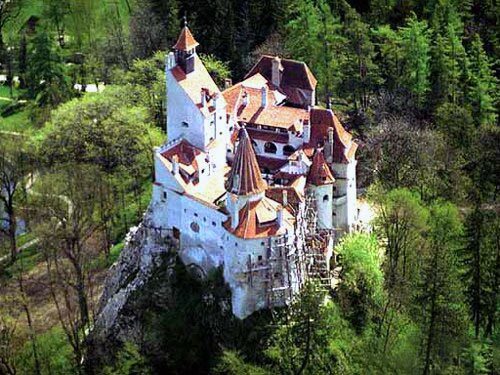 Bran Castle is often called "Dracula's Castle" because of rumors that Dracula once lived in that very castle. Curtea de Arges is one of the oldest in Romania. According to tradition it was founded early in the 13th century by Negru Voda (or Radu Negru), succeeding Campulung as capital of Wallachia. The Cathedral of Curtea de Arges (early 16th century) is one of the most famous buildings in Romania, and stands in the grounds of a monastery. 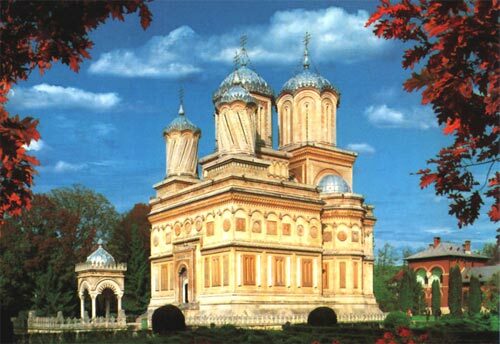 It resembles a very large and elaborate mausoleum, built in Byzantine style, with Moorish arabesques. In shape it is oblong, with a many-sided annex at the back. In the centre rises a dome, fronted by two smaller cupolas, while a secondary dome, broader and loftier than the central one, springs from the annex. Each summit is crowned by an inverted pear-shaped stone, bearing a triple cross, emblematic of the Trinity. Its legends have inspired many Romanian poets, among them the celebrated Vasile Alecsandri. One tradition describes how Neagoe Basarab, while a hostage in Constantinople, designed a splendid mosque for the sultan, returning to build the cathedral out of the surplus materials. Another version has Radu Negru employing one Mesterul Manole or Manoli as architect. Manole being unable to finish the walls, the prince threatened him and his assistants with death. At last Manole suggested that they should follow the ancient custom of placing a living woman into the foundations; and that she who first appeared on the following morning should be the victim. The other masons warned their families, and Manole was forced to sacrifice his own wife. Thus the cathedral was built. When Manole and his masons told the prince that they could always build an even greater building, Radu Negru had them stranded on the roof so that they could not build something to match it. They fashioned wooden wings and tried to fly off the roof, but, one by one, they all fell to the ground. A spring of clear water, named after Manole, is said to mark the spot where he fell. 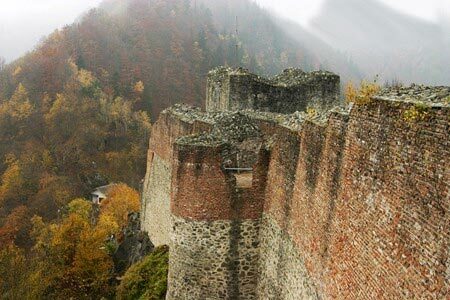 Poenari Castle was erected around the beginning of the 13th century by the rulers of Wallachia. Around the 14th century, Poenari was the main citadel of the Basarab rulers. In the next few decades, the name and the residents changed a few times but eventually the castle was abandoned and left in ruins. However, in the 15th century, realizing the potential for a castle perched high on a steep precipice of rock, Vlad III the Impaler repaired and consolidated the structure, making it one of his main fortresses. Although the castle was used for many years after Vlad's death in 1476, it eventually was abandoned again in the first half of the 16th century and was in ruins by the 17th century. Due to its size and location, control of the castle was difficult to take, even by natural forces. However, in 1888, a landslide brought down a portion of the castle which crashed into the river far below. Nonetheless, the castle was slightly repaired and the walls and its towers still stand today. To reach the castle, visitors need to climb 1,500 steps.